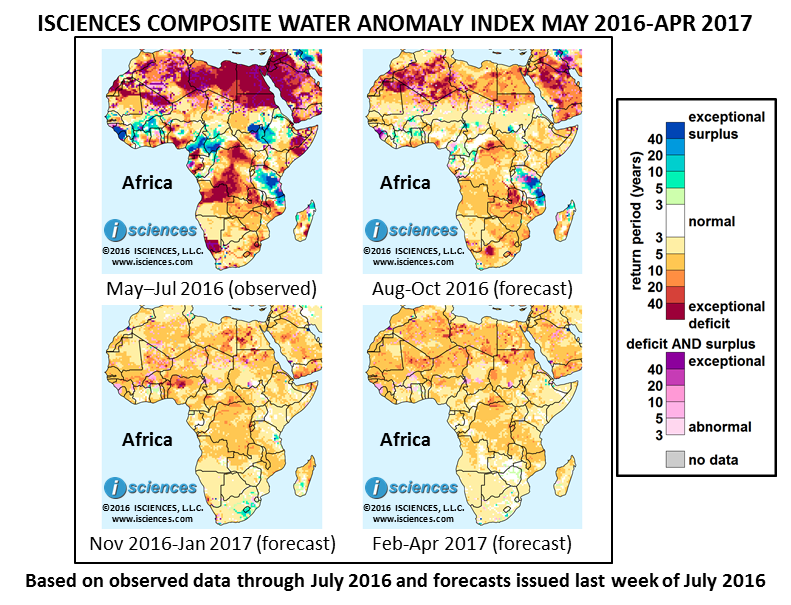 Widespread water deficits forecast across North Africa are evident in the 12-month map for May 2016 through April 2017 (below). Deficits of varying severity are also expected in Democratic Republic of the Congo, southeastern Central African Republic, Angola, southern Namibia, northeastern Zambia, southern Malawi, northern Mozambique, and Nigeria. Citing continuing drought and the weak rand, the latest annual baseline report from South Africa's Bureau for Food and Agricultural Policy says that South Africans are taking out credit just to live and eat. The cost of monthly food staples rose by 23.8% from April 2015 – March 2016. Water rationing has begun in Swaziland's capital, Mbabane, due to decreased water levels at the Hawane Dam. Levels have dropped from 15 percent to 9 percent recently, and until the arrival of summer rains in October there will be no piped water for four days a week and residents will have to rely on mobile water tanks. Egypt's Water Ministry, which declared a state of emergency from May to August due to drought and has been pushing for tighter water curtailment policies, is battling media reports of higher flooding rates and being accused of hiding data. One former Minister of Water Resources and Irrigation, while encouraging greater transparency, emphasized that water use optimization must be separated from flooding because Egypt’s share of Nile waters does not meet the country's needs and no amount of flooding will resolve the water scarcity. Nearby in Sudan flooding in Sudan has killed 100 people, displaced thousands, submerged villages, and cut off the main highway between east Sudan and Khartoum. Transboundary water issues are surfacing in Lesotho, site of the Katse Dam, Africa's second largest. Crops are failing as a result of the drought and a quarter of the population is in need of food assistance, while farmers say they do not have access to irrigation water from the Katse Dam. When built in the 1990s it was stipulated that the dam would supply Lesotho with hydroelectricity and supply Pretoria and Johannesburg, South Africa, with water. The dam flooded verdant riverside fields in Lesotho and displaced farmers. Health experts are struggling to contain a massive outbreak of yellow fever, a mosquito-borne illness, in Angola and Democratic Republic of the Congo before the start of the rainy season. With a shortage of vaccine, dosages are being diluted to treat five people instead of one, an emergency measure which provides one year of immunity instead of lifetime. The World Health Organization is concerned about the possibility of yellow fever exploding out of central Africa and spreading to Asia via unvaccinated Chinese laborers in the region. Though the extent of exceptional deficits (greater than 40 years) across North Africa is forecast to shrink from August through October, as seen in the 3-month map below, many areas will remain in notable conditions of deficit including: Western Sahara, Mauritania, Algeria, Libya, Egypt, and northern Sudan. Both deficits and surpluses are expected in Algeria. Deficits will persist in Democratic Republic of the Congo, southeastern Central African Republic, and much of Africa’s southern half, with extreme (20 to 40 year) to exceptional deficits forecast to persist in northern Zambia through November. Deficits will spread in Ethiopia, and persist with diminished severity in Somaliland and Somalia, though deficits on the Juba River in southern Somalia may be severe (10 to 20 years). Water surpluses are forecast to persist through October in Tanzania and northeastern Mozambique. From November through January nearly all of Africa is forecast to experience some degree of water deficit, primarily moderate (5 to 10 years) with scattered small pockets of extreme deficits. Surpluses are forecast to emerge along rivers in South Africa, including the Orange River through South Africa and Lesotho. The forecast for February through April shows conditions similar to the forecast for November through January.